Dewang Mehta was born on August 10, 1962, in a sleepy hamlet called Umreth, in the interiors of Gujarat, India. The first six years of his life were spent in the idyllic rural surroundings, instilling within him a love for the soil. The decision of his parents to move to Delhi in Mehta’s sixth year, brought him into the heart of metro action. His formal education began at the Bhartiya Vidya Bhavan, a school in the capital city, following which attempted to pursue a course in medicine. In 1979, he got admission in three medical colleges, including the prestigious All India Institute of Medical Sciences (AIIMS). However, owing to some admission policy rules–where his physics marks in the school examination did not measure up to the required standards–Dewang was unable to fulfill his long cherished dream of becoming a doctor. Dewang’s next move was to Mumbai and the St. Xaviers College where he opted for a degree in Political Science, French and History. This plan too ran into problems with his parents disapproving of his choice of subjects. Subsequently, he opted out of the Bachelor of Arts program and began working towards a career in chartered accountancy. He was a CA by 1984, though it was clearly not his only calling. Right through his student years, Dewang dabbled in an assortment of work, adding to his skills and professional credentials. Apart from a brief flirtation with journalism and a long-time affair with writing, he also participated in politics. Another passion was computer graphics and he learnt about this emerging hi-tech segment at the Imperial College, London, where he also had his first encounter with movie and ad film making. Dewang was always fascinated with the celluloid world and remained extremely keen, until the very end, to make a commercial Hindi film on his own. He also interacted actively with his Bollywood favorites, enlisting their help for pushing the cause of software—his first love. His interest in film making went back to 1977, when on a vacation in his village he was introduced to celebrated director of the “art cinema genre,” Shyam Benegal. For two entire months, Dewang worked with Benegal as a spot boy, absorbing the finer nuances of film making and getting a feel of the action behind the all-seeing camera. As the man behind the camera Dewang also created “Glimpses of India,” a 20-minute documentary on Indian tourism. Recognition came his way as the film—his debut into the “reel” world–won an award in the Commonwealth Film festival in Leeds in 1983. Dewang’s love for the written word was yet another passion he carefully nurtured and used effectively in the course of his professional work. He used his writing skills as a powerful tool to preach the bible of Information Technology to an India that was gradually awakening to the digital world. 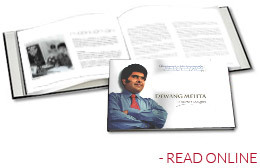 From opinions and columns in the country’s leading and business dailies, to special supplements on the Indian software industry in well-known international journals such as Red Herring and Business Week—Dewang Mehta’s editorial repertoire was as rich as it was varied. The turning point in Dewang’s life however came in 1991 when an old-time friend and IT industry veteran Harish Mehta offered him charge of NASSCOM, an association dedicated to the needs of the fledgling software industry. After much thought, deliberation and some hesitation, Dewang accepted a “three times a week” part-time assignment with the organization that allowed him to pursue his other interests. NASSCOM was clearly the most rewarding period of Dewang’s existence—possibly the most fulfilling, not just professionally but also personally. The period between 1991-2001 was one of transformation and growth, for both NASSCOM and Dewang. Each drew sustenance from the other. As Dewang grew in stature, gaining respect within the Indian ICT sector as an industry leader, NASSCOM too began to evolve into an association of substance. It wasn’t long before the body had become the key voice of the Indian software and services segment. And it all happened thanks to the fact that visionaries like Dewang not only laid the foundation for a robust software sector, but also continued to play a key role in the building process. Dewang certainly had reason to feel proud of the strides he had been able to make with the Government. No matter who was in power, software always received special treatment. Dewang’s intensive parlays with the “right” people in the corridors of power, his cooperative stance with IT related departments such as the DoE, the DoT, the VSNL and more recently, the Ministry of Information Technology, enabled him to wrest concessions that other industries found hard to get through or match. From the zero duty on software imports, to crucial income tax concessions for software exporters, to stringent Copyright Laws, the introduction of the IT Act and resulting cyber laws—Dewang managed to push through an extensive software industry wish list. Recognizing the potential of the software and services segment as a major foreign exchange earner, Dewang launched the India Inc. crusade, where he personally presented the country’s software industry to the world. Today, the software sector has set before itself an enormous ambition of $154 billion worth of software exports by 2018. Dewang dreamed this dream, championed this vision! On the home side Dewang played the role of the guru, guiding the central and state Governments in their path towards IT-fication. He helped at least 19 state Governments draft their IT policies, and create the requisite infrastructure to aid the cause of software within their realms. Besides a dream for the software industry, Dewang had a blueprint for the IT industry and how it could be used effectively to change the lives of India’s teeming millions. He wanted the benefits of IT to peter down to the grass root levels and his favorite slogan, “roti, kapada, makan, bijli and bandwidth” epitomized the needs of the emerging, 21st century Indian.